4th Night FREE when you book at Lakeside Living! It's time to enjoy the beach, bike path and breweries! Walk, ride or stumble! JAZZ FEST, BREWERS FEST, FESTIVAL OF FOOLS, ART HOP, FIRST NIGHT to name a few exciting events in Burlington all year long! Situated on Lake Champlain in the desirable, artsy, south end of Burlington. Relax in a newly renovated, 1 BR apartment with 1 comfy queen bed with luxurious linens. Fully equipped kitchen, and all the luxuries of home. Located on the city bike path, less than a mile to downtown Burlington and1 1/2 hours to Montreal. Behind you is your swimable, sandy private beach and out the front is a city park with fields and a playground. BEST location in town! Restaurants, breweries, art galleries all within walking distance. Three miles to the airport and public transportation 2 doors down! This is a duplex in the historical French Canadian neighborhood. We, the owners, live next door but you have all the privacy you need! Toddlers welcome, porta crib provided. We love to visit other VRBO when we travel. We also enjoy a good hike and a good pint. When home in Burlington we enjoy all athletic activities when we aren't being lazy and sitting on the beach! Views...AND access to bike path, parks, beach, downtown, breweries, art studios, fabulous restaurants, vibrant art scene, on and on and on! Private apartment and fully equipped. Amazing sunsets! We loved our stay. Warm, cozy and wonderful location. Excellent spot to explore Burlington in the comfort of a great little neighborhood. We would absolutely stay here again! We had such a great time when we last visited, in 2017, that we couldn't pass up the opportunity to stay here again when we saw that it was available for Thanksgiving weekend. You couldn't ask for a better host than Deb- who was kind enough to allow us to check in early and check out late since she was away for the holiday weekend. She even offered us her roasting pan for Thanksgiving Day- which was much appreciated though we decided to spend the day in Montreal. The house manual is full of local dining and recreational recommendations (plus more on her chalkboard)- so if you can't enjoy yourself while you're staying here, it's your own fault. My wife and I decided that this is the first place that we will check for vacancies when planning our next Vermont trip. Thanks again Deb! Can't wait to come back! This place is the PERFECT place to stay in Burlington. The owners are fantastic and everything you need for a cozy, quiet, yet convenient visit is right here. The bike path is practically in your backyard and you can bike, walk, or drive just a short distance to downtown. I would stay here again in a heartbeat. You cannot go wrong with this location!! We thank YOU, for having such a good time! Beautiful, comfortable, convenient to lakeshore, bike path, and town. The apartment had everything one might need, plus. The location is ideal for exploring Burlington and the entire region. We loved the neighborhood. 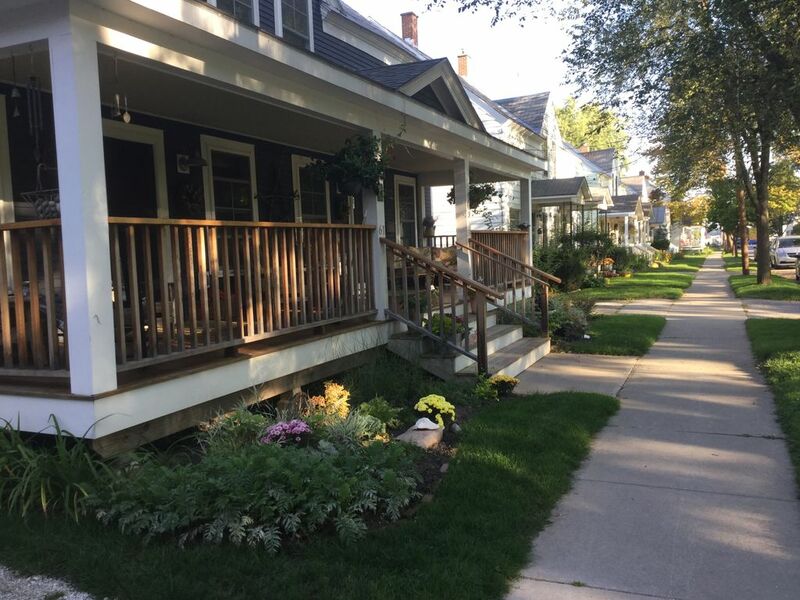 After long days exploring the the Vermont countryside, we came back to a comfortable house and a great neighborhood within walking distance to the breweries, restaurants, and a grocery store. The accommodations were clean and well appointed. We strongly recommend. Location to downtown was excellent. Cozy and very clean. Loved walking down on the beach and watching the sunsets. Thank you John and Deb and Rita! Thank you so much for staying and choosing our apartment at Lakeside and for keeping everything so neat and tidy! We love having guests from all over the US and world! Please not pets and no smoking.